The S-band 'CAMRa' radar has been been used to make measurements of cloud, precipitation, and clear-air phenomena for the past 30 years. Operating at 3 GHz means that the attenuation of the radar signal is low through cloud and precipitation, whilst the steerable 25m dish allows high resolution, high-sensitivity measurements to be made along any azimuth/elevation (including the usual PPI and RHI scans). The radar has a full dual-polarisation capability, allowing measurements of differential reflectivity ZDR, depolarisation LDR, phiDP, KDP and rhoHV. 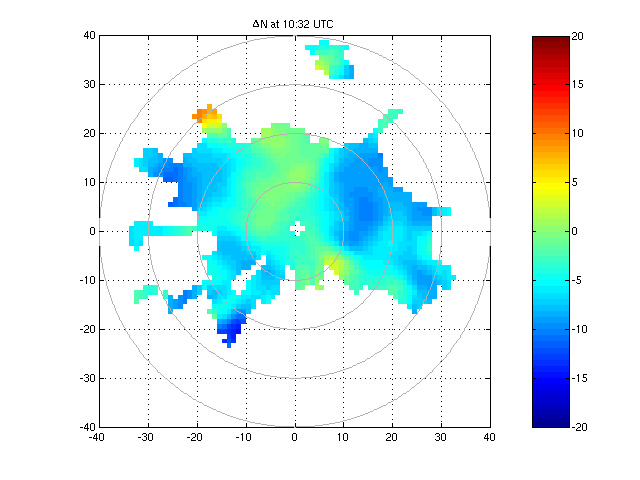 These polarisation parameters provide extra information on cloud and precipitation, for example: the size of raindrops may be estimated from their shape (big drops are more oblate, with a different polarisation signature); the detection of hail; the shape of ice crystals and melting snowflakes, and the distribution of canting angles (these are major uncertainties in the interpretation of radar and lidar data from ice particles). The radar is Dopplerised, with a folding velocity of 15m/s, allowing measurement of hydrometeor fall speeds and air motion velocities. The L-band 'ACROBAT' radar makes use of the fact that backscatter at this wavelength occurs in part due to Bragg scattering from refractive index variations in turbulent air. This allows us to make direct measurements of the motion of the air itself, and since the Chilbolton radar is mounted on the main 25-m dish, it also has the unique capability of being physically scanned in almost any direction, allowing the user to obtain a 'snapshot' of the atmospheric structure in a vertical or azimuthal plane. 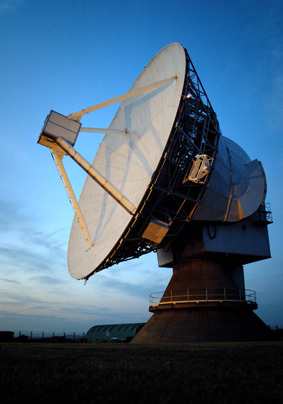 The large dish size leads to a particularly narrow beam-width for this class of radar (0.7o). The radar normally operates in a mode suited to scanning through the boundary layer, with an unambiguous range of 48 km. Like the 35 GHz cloud radar, pulse coding techniques are used to maximise the sensitivity whilst maintaining high range resolution. Computer-controlled transmit waveform generation technology, together with a PC-based data acquisition and processing system, provide considerable versatility in terms of custom operating modes. ACROBAT has proved to be an excellent tool for studying convective structures in the boundary layer. Since convection, by its very nature, is associated with strong temperature and humidity gradients, it leads to strong clear-air radar returns in the boundary layer. Convective structures lead to a characteristic pattern of arches and plumes in RHI scans of radar reflectivity. RHI scan 10th July 2004 (CSIP pilot) showing developing convective activity in the boundary layer. In PPI scans, convective elements are often visible as ring-shaped structures, indicating the strong refractive index gradients at the edges of individual convective cells. ACROBAT played a key role in the Convective Storm Initiation Project (CSIP) campaign in the summer of 2005, providing impressive new observations of the air breaking through the convective 'lid' - this is the process which controls where and when storms will occur, but which is not usually resolved by numerical weather models. The ACROBAT radar transmitter and receiver are phase-locked to a stable frequency reference. This allows the radar to make accurate measurements of the phase of radar echo returns. Fabry et al. (1997) showed how such phase measurements can be used to measure fields of surface refractive index changes. By isolating the returns from stable ground clutter targets and tracking the phase of their radar returns with time, changes in refractive index in the paths between these targets can be monitored. This allows fields of refractivity variations to be obtained with an accuracy of a few parts per million. The radio refractive index of the atmosphere is highly dependent on humidity, and these refractivity measurements will be extremely useful in tracking humidity anomalies associated with the onset of convection and precipitation. Field of horizontal refractive index anomalies measured on 10 July 2004. The green band in the middle of the field (higher refractivity than the surroundings) is associated with a convective system passing over the radar site. Having demonstrated the usefulness of this technique at L-band, work is currently underway to apply it to the operational weather radars used by the Met-Office (C-band).